Title: 05/15/1992 - MSDS requirements in the workplace. This is in further response to your letter of March 5, addressed to President Bush, concerning the requirements of the Occupational Safety and Health Administration (OSHA) for material safety data sheets (MSDSs) to be present in workplaces for hazardous chemicals. The requirement for MSDSs for hazardous chemicals utilized in workplaces is set forth under OSHA's Hazard Communication Standard (HCS), 29 CFR 1910.1200 (copy enclosed). The HCS is based on a simple concept - that employees have both a need and a right to know the identities of the chemicals they are exposed to when working and the hazard associated with them. They also need to know what protective measures are appropriate to prevent adverse affects from occurring. The HCS is designed to provide employees with this information ultimately for the reduction of the incidence of chemical source illnesses and injuries. The HCS established uniform requirements to make sure that the hazards of all chemicals imported into, produced, or used in U.S. workplaces are evaluated and that this hazard information is transmitted to affected employers and employees via labels on containers and material safety data sheets. In addition, all covered employers must have a written hazard communication program which describes how this information will be provided to their employees. OSHA believes that knowledge acquired under the HCS will help employers provide safer workplaces for their employees. When employers have information about the chemicals being used, they can take steps to reduce workplace exposures, substitute less hazardous materials, and establish proper work practices. In your letter you raised concern that you must have a MSDS for "materials that can be purchased on the grocery store shelf." The HCS applies to all hazardous chemicals used in a workplace, but exempts consumer products if their use is of the same duration or frequency as that of normal consumer use (see 29 CFR 1910.1200(b)(6)(ix). Your letter mentions such items as "dishwashing soap, rubbing alcohol, Clorox bleach and other miscellaneous cleaning products." If your employees' use of these chemicals is the same as that of normal consumers - they use a cleanser, say, as you would at home, to clean sinks or counter tops, for example - then such products would not need to be addressed in your hazard communication program. If, however, an employee's job goes beyond normal household use e.g., cleaning sinks all day, then the employee would be entitled to the hazard communication information (via a material safety data sheet and appropriate training) on the hazards that product may pose. 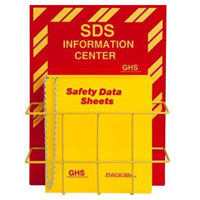 Mark the locations of your safety equipment and training materials with signs from Safety Emporium. In your letter you also stated that "if somebody were poisoned in my office my first reaction would (not) be to run to the file cabinet and pull out one of these forms. As a physician I would treat the problem appropriately and if necessary consult a poison control center." As explained earlier in this response, the role of the MSDS under the rule is to provide information on essentially everything that is known about the chemical, including detailed information on potential hazardous effects, physical and chemical characteristics, and recommendations for appropriate protective measures. This information is not provided only to respond to "poisoning" incidents once they occur; it is necessary for you, the employer, to use in order to properly design and implement protective programs for your workplace. It is also important for employees, since this information will enable workers to know how to work safely with the chemical(s). Hazard information, in the form of MSDSs and labeled containers, must be readily accessible to all workers when they are in their work areas during their workshifts. OSHA has developed a variety of materials and publications to help employers and employees understand this important workplace safety and health standard and develop and implement effective workplace hazard communication programs. We have included for your reference a copy of two OSHA booklets, "Chemical Hazard Communication" and Hazard Communication Guidelines for Compliance."